30 years ago today, the Voyager 1 spacecraft encountered the first planet in the Voyager programs decade-long epoch tour of the outer solar system. While Pioneer 10 and 11 were the first space probes to reach Jupiter, proving passage through the asteroid belt was possible, Voyager 1 opened up the worlds of Jupiter system to humanity, turning these moons from mere points of light into fully-realized worlds. Voyager 1 flew within 19,000 km of Io, making it the best resolved world during the spacecraft's passage through the Jupiter system. The world Voyager 1's cameras revealed was unlike anything planetary scientists. Instead of being dead with numerous impact craters, like our own moon, they found a world with strange pits, flow terrain, an incredible diversity of albedo markings, and mountains 10-20 km tall. Global mosaics revealed a dark, horseshoe shaped pit, an albedo marking shaped like a hoof-print (in keeping with the myth of Io, a lover of Zeus who was transformed into a cow to protect her from Zeus's wife, Hera). 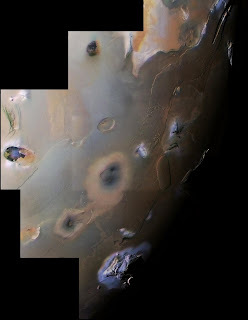 Voyager 1's highest-resolution images covered the southern pro-jovian hemisphere of Io, an area not seen again at high resolution (Galileo's best images of the region were on the order of 10-20 km/pixel). You can see my attempt to piece together Voyager 1's highest resolution mosaic, though I can't seem to find where I put the original project files... 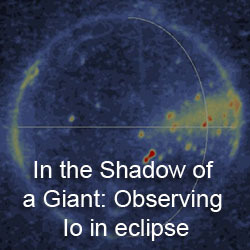 These images revealed numerous large, volcanic pits, low scarps that cross Io's generally flat terrain, and large mountains. But not a single impact crater, unlike any other solid-body world in the solar system imaged to that point. 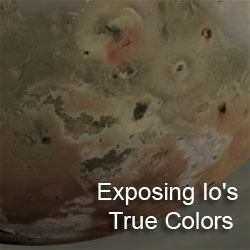 Recent volcanic activity on Io would explain the lack of impact craters on its surface. 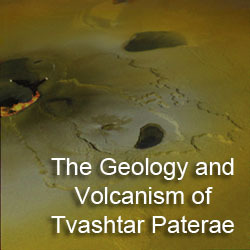 Within a short time after a crater forms, the feature is filled in with lava and pyroclastic material. An explanation for these amazing images came in the form of a paper published in the journal Science only three days before the Voyager encounter by Stan Peale, Patrick Cassen, and R. T. Reynolds. 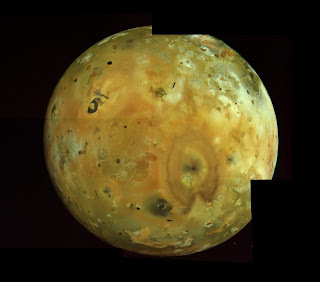 They suggested that the varying tidal pull on Io by Jupiter, created by the orbital resonances with the other Galilean satellites, would heat up and partially melt Io's interior. This internal heat would then be released in the form of volcanic activity. This only left the question of whether Io was still active. Voyager 1 provided a wealth of information about not just Io, but the other moons in the Jovian system as well as Jupiter itself. Images revealed three additional small moons of Jupiter (later named Metis, Adrastea, and Thebe) orbiting near Amalthea, as well as narrow ring of material confirming a prediction made by Acuña and Ness 1976 based on Pioneer charged particle data. 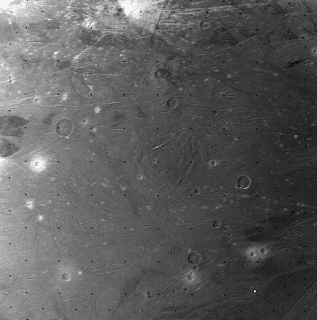 Voyager 1's cameras also revealed in detail the cratered and grooved surface of Ganymede and the ancient surface of Callisto. The spacecraft never came very close to Europa and could only hint at the amazing surface features seen by Voyager 2 four months later and Galileo 16 years later. Voyager imaging scientists did note a lack of obvious impact features as well as dark, linear streaks criss-crossing Europa's surface. 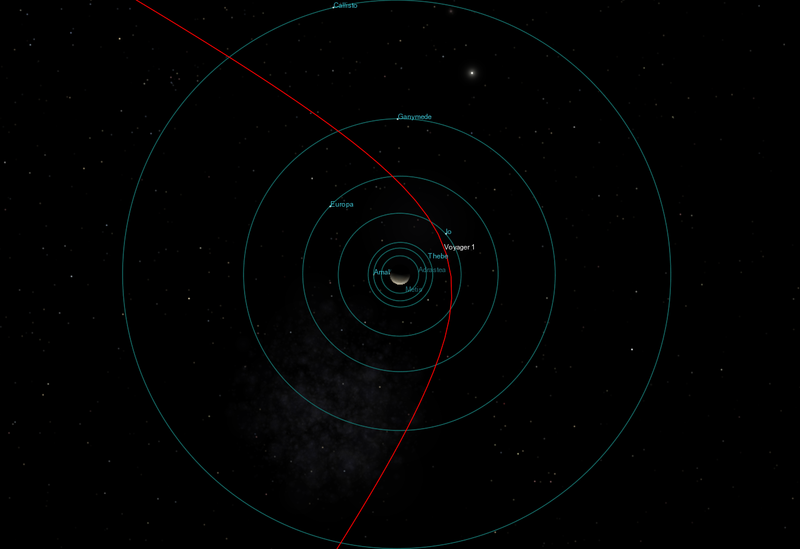 The Voyager 1 flyby of the Jupiter system 30 years ago today truly opened up the moons of the outer planets to humanity. The robotic explorer transformed the four Galilean satellites from points of light in the sky to worlds with geology and amazing vistas. The discoveries made at Io, of a world of abundant active volcanism, were perhaps the most amazing of a truly incredible encounter. Later this week, we'll look back at the discovery of active volcanism on Io and on the post-Voyager view of Io's interior and how it compares to our view now.